Hereford is one of the three cities that make up the Three Counties Region with Gloucester and Worcester being the other two. Centrally located and close to the Welsh border situated on the River Wye, it is chiefly known as a trading centre for a wider agricultural and rural area. Products from Hereford include cider, beer, leather goods, nickel alloys, poultry, chemicals, and cattle including the famous Hereford breed. It is famous for its high quality produce and many food and drink manufacturers are located in the region. It also has a long standing association with the armed forces particularly the Special Air Service. Hereford has always had a strong cultural heritage. It is one of the three cathedral cities to host the famous Three Choirs Festival associated with the English composer Sir Edward Elgar and there is a thriving arts and cultural scene with the Courtyard Theatre and many other museums and art galleries situated in the city. It is also home to the famous Mappa Mundi which can be seen in Hereford Cathedral. It has a thriving shopping centre with many restaurants and cafés. Being so centrally located, Young & Co can service clients right cross the UK and we are no more than 2 hours drive away from any of the leading commercial cities in the country. 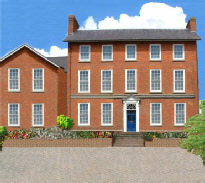 Young & Co is situated in Bewell House which was built in the latter half the 18th Century. The 1881 census shows that Bewell House was number 19 Bewell Street and we are not sure when it became Bewell House but an article in the Hereford Times as far back as 1838, shows an occupant, Mr Reynolds who made a contribution to the organ repairs at All Saints Church. Bewell House is a Grade II listed building having been listed in November 1972. Charles Bulmer, a wine merchant who was thought to have lived at Bewell House in 1841-1851 with his wife Francis, daughter and servants. The two daughters of Reverend Thomas Philips moved their “Establishment of Young Ladies” into the building around 1853-1855. Between January 1856-57 Francis Henry Thomas and his family moved into the house who was a local dignitary and the Justice of the Peace and the Deputy Lieutenant for Hereford. In November 1859 he formed the “Volunteer Corps of Riflemen” at Bewell House. He lived in the house until 1872 when he died at the age of 84. The most famous resident of Bewell House was Charles Watkins, father of the famous photographer, Alfred Watkins. Charles Watkins was the owner of the Imperial Brewery on Bewell Street which brewed Imperial Household and Pale Ales. Other ales were added later and the brewery won a gold medal at the International Exhibition for their Golden Sunlight Pale Ale. Charles also owned a number of Public Houses and was a property developer. Holmer Park was built for him in 1860. Following Charles’s death in 1889 the brewery passed to his sons Henry and Alfred who sold it to Tredegar Brewery for £64,000. Henry Hull the new manager of the brewery then moved his family in to Bewell House and is listed as an occupant in 1891.